Bush meat is a known a delicacy in many parts of Nigeria. Indeed, many Nigerians cannot forget in a hurry its delicious aroma and taste in native soups, such as Egusi, Efo and Ofe Isla. Game meats are usually free-range animals, which mean they have less saturated fat, which makes them healthier than other fatty meats. They are also low in calories when compared with beef and chicken. 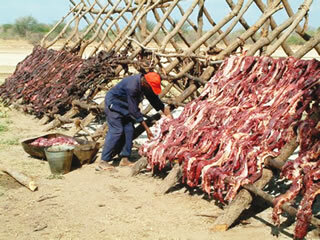 Bush meat is high in Eicosapentaenoic acid, an essential omega-3 fatty acid that has several cardiovascular benefits. Also, because it is grown in a natural environment, game meat is usually rich in vitamins and minerals, and free from growth hormones, which are the norm in domestic meat and poultry products. However, as nutritious and tasty as it is, one can contract the Ebola Virus Disease by eating raw and infected bush meat. Scientists say consumption and preparation of meat from forest animals, such as fruit bats, monkeys and chimpanzees is behind the transmission of Ebola, which has killed over 660 persons in the last six months in West Africa.break of Ebola — a disease that causes its victims to bleed to death– to the indiscriminate consumption of raw bush meat and other exotic animals. For one, meats from grass cutters, antelopes, gorillas and chimpanzees are a preferred delicacy in Liberia, Guinea and Sierra Leone, countries where the virus is spreading like wildfire. Veterinary expert, Dr. Femi Oboye, notes that game meats are known hosts to Ebola, anthrax and yellow fever and some other deadly fever Oboye states that those residing in countries with poor meat inspection policy are at a greater risk of contracting the virus. “Forest animals like monkeys, gorillas and chimpanzees can also get the disease and pass it to humans. Apes are hosts to diseases, such as Ebola, anthrax and yellow fever. One can be infected if one is exposed to the secretions of an infected animal or eats an infected animal. “We must careful because game meats are hardly inspected before they are sold in the market in many African countries. No procedures are carried out by a professional to determine and guarantee either the flesh or organs are free of diseases and other contaminants,” he adds. Oboye notes that unlike food poisoning where its symptoms manifest a few hours after eating the food, it takes, at least, two to three weeks for the symptoms of Ebola to show in infected persons. The contracting of Ebola, the World Health Organisation also states can be by eating fruit bats or eating fruits that have been infected by bats. The body notes, Fruit bats are known hosts for the virus. So, we are warning that people should stay off eating fruit bats or dead animals that may have been infected this period. Nutritionist, Dr. Yomi Agaja, says this warning is not to say that Nigerians should stay off fruits, but they must be cleaned, properly washed or disinfected in some cases to make sure that some bacteria or viruses that may be in such fruits are denatured. He states, “Ebola is transferred from fruit bats to humans or fruits. It is usually not obvious when a fruit is infected. But you can take precautions. Do not buy any fruit that looks infected from the market. When you want to prepare it, wash the outer layers. After that, you can disinfect it with vinegar. Ebola Virus Disease — also known as Ebola haemorrhagic fever — is one of the most virulent viral diseases known to humankind. For now, the disease has no cure or vaccine and kills up to 90 per cent of its victims within days of its incubation in the body system. The WHO describes the recent outbreak as the most challenging so far due to the low level of awareness and poor access to quick treatment in affected countries. The early symptoms of Ebola mimic that of malaria and fever. They may not be identified right away – particularly in the early stages of the disease. Family, friends and health care workers can easily contract the virus while caring for an infected individual, a reason why the disease spreads like fire. As there is no cure for the disease, prevention is, therefore, the watchword. Experts urge individuals to adhere to stringent personal and environment hygiene to minimise the risk for the infecting the virus. Top Private Hospitals in Bangalore can offer help to you in every single way. It has many benefits that you can take advantage of in order to help you to continue your life on a positive note. They have wide range of services intended to help you to feel better and find your health in every single way.